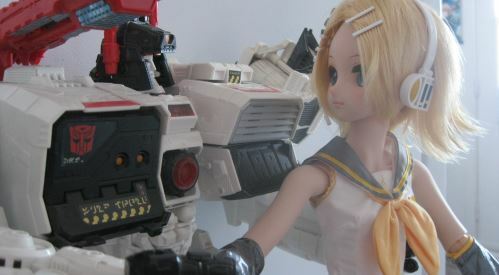 Seibertron.com Energon Pub Forums • Trash Talk and Hot Air. Trash Talk and Hot Air. Trash Talk is the small one. He's the kind to find the most hurting insult possible and he'll find any occasions to ridiculise you. Hot Air is the big one. He'll shove you around and if you complain, you'll get punched by this brute. Both of they are relatively young and are bullies. What if their target his too big? They then combine in one of their two forms of giant robot. Both are callous cowards. Their bulliing was so bad, that they have been ejected from the academy. So, what did they do? Quit the and join the instead, of course. Over there, their douchebagry is tolerated because they make the weak, -the REALLY WEAKS- fee like trash and this is a very good mentalioty. The strong are the best, the weak must sufffer. Even among their own. Here's the robot modes. As you can see, they have scratched away the sculpted logo when they were thrown out of the Academy and when they joined the . Kinda like Armada Wheeljack. Here's the Hot Air combination mode. Quite a massive brute. Finally, the Trash Talk combined mode. What a dooche. The pros will know that I used the Energon Ironhide and HotShot molds. I'm very, very happy of the final results and that everything worked so well together! I hope you enjoyed! "You gonna cry? Tell me, you gonna cry?" "Gimme that energon or I will transform you into a tiny cube!" Re: Trash Talk and Hot Air. That idea was way too good to pass on! This is a really cool idea. I like that Hot Air has the head of a flying transformer, giving a slight nod to the character's name. Also, I like how both the heads are that of decepticons, as if their misalignment with autobots was long fortold. And Trash talk is easily my favourite of the two because of the head used. It works really well. Which movie decepticon head is it from? Looks like megatron but I dont know from which toy. And the Trash Talk combined form works very well. william-james88 wrote: This is a really cool idea. I like that Hot Air has the head of a flying transformer, giving a slight nod to the character's name. Also, I like how both the heads are that of decepticons, as if their misalignment with autobots was long fortold. And Trash talk is easily my favourite of the two because of the head used. It works really well. Which movie decepticon head is it from? Looks like megatron but I dont know from which toy. I used only decepticon heads kinda without noticing. I had a spare Lugnut head. That head felt brutish and stupid so, for the big guy. It was easy to install. However, it dosent turn. As for Trash Talk, it was a bit harder. I had to deal with the fact that I needed a bigger head, but with a ball joint that attach to the back of the head and can move to the bottom. After much fiddling, I used the back of the head of the original Hotshot, with the ball joint attachment. 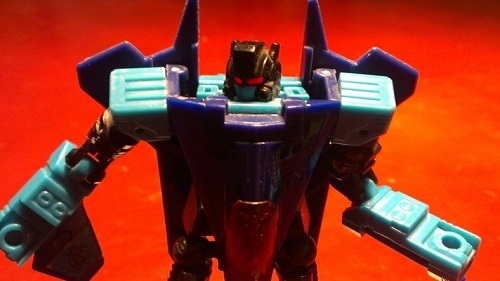 As for the front, I used a head that could perfectly split in two so I could swap faces with Hotshot. A scrap ROTF Fast Action Battler Megatron I found at a garrage sale for 1$ came to the rescue. It's the perfect face just because of his eveil look with a mocking grin. What I really love about this custom duo is that it's like having 6 toys in 2. I love the vehicle modes but the individual bots are iffy. Blame the original molds. However, the duo truly shine with their two COMPLETELY DIFFERENT combined modes. The combined modes impressed me and made me really glad. And my next project is coming along smoothly! I recently played with them. Still proud of it! Followed the link from the 'Five Best Ironhide toys' thread. Two very nice customs! Thanks! these were fun to make. 5,161 pages were recently viewed by 1,196 unique visitors. This page was viewed 1 times on Friday, April 19th 2019 9:22pm CDT. © 2019 Seibertron, Inc. DBA Seibertron.com. All Rights Reserved. Established June 2000. Seibertron.com is owned by Ryan Yzquierdo.